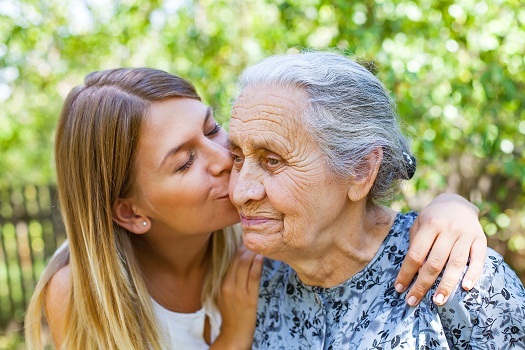 Providing care to aging adults with dementia is an overwhelming responsibility, which is why it’s important to familiarize yourself with this cognitive disorder and all of its symptoms. Caregivers who are fully aware of various dementia symptoms are able to provide better care to their aging parents. Here are a few things dementia caregivers should remember at all times. Many dementia caregivers mistakenly believe their loved one is acting a certain way on purpose. Dementia changes almost every aspect of an individual’s personality, which can lead to erratic behavior. When your loved one becomes argumentative or combative, you need to take a step back and reassess the situation. Trying to use logic to prove your point could make your loved one more confused and angry. Older adults with dementia can benefit from professional in-home care. If your senior loved one needs help managing an illness or assistance with daily tasks, make sure you choose a top-rated provider of home care. Victoria Home Care Assistance is here to help your loved one live a happier and healthier life in the golden years. From the mentally stimulating activities in our Cognitive Therapeutics Method to our friendly Care Managers who are available to answer your questions 24 hours a day, we offer a wide array of high-quality at-home care services. Communicating with older adults with dementia can be difficult at times. As your loved one’s condition progresses, you need to focus on simple sentences and straightforward messages. Instead of asking your parent what he or she would like to have for dinner, provide two clear options or simply state what time dinner will be ready. You might also want to use visual clues like pointing to a picture of the meal or holding up two different shirts to see which one your parent wants to wear. If your loved one becomes angry or confused, redirect the conversation or use distractions. Dementia makes it difficult for seniors to manage daily activities independently. Whether your elderly loved one needs part-time assistance with basic household chores or you need a break from your caregiving duties, the Victoria respite care experts at Home Care Assistance are here to help. All of our respite care services are backed with a 100% satisfaction guarantee, there are no hidden fees in our contracts, and we never ask our clients to sign long-term contracts. The symptoms of dementia must be carefully tracked so your loved one’s medical team can adjust the treatments. A drug or supplement that worked for a short time may completely alter your loved one’s mood after a few months. The easiest way to track all of the symptoms is to keep a caregiving journal that includes information such as reactions to certain stimuli and a list of necessary medications. Whenever you notice any changes to your loved one’s personality, you should bring it up to his or her neurologist or primary physician. Another issue many dementia caregivers face is asking for extra help. Caring for a senior with dementia requires an incredible amount of time and energy, and there may come a point when you need to ask for assistance. Having a family member bring over a cooked meal or spend some time with your loved one a few days a week can free up quite a bit of your time. You might also want to consider working with a professional caregiver who specializes in cognitive disorders. If your elderly loved one is living with a serious medical condition and needs help managing the tasks of daily living, reach out to Home Care Assistance, a Victoria senior care agency you can trust. Our caregivers are available 24/7, there are no hidden fees in our contracts, and we offer a 100% satisfaction guarantee on all of our in-home care services. To hire a professionally trained caregiver for your aging parent, give us a call at (250) 592-4881 today.